n Mexico’s first of two friendlies ahead of their busy summer of games, it was Croatia who stole the show, scoring two first half goals in two minutes authored by Duje Cop (35′) and Fran Tudor (37′) to defeat El Tri 2-1. Javier ‘Chicharito’ Hernandez (87′) did score a goal that broke his tie with now commentator Jared Borgetti as Mexico’s all-time leading goalscorer, but it was not enough to break a first half in which El Tri had played too innocently for too long. Mexico opened the match with control of the ball, but they found it difficult early to break through the Vatreni‘s tight blocks, with players seemingly unwilling to recognize gaps and offensive positions inside the defensive shape to take their chances. But the selection of Juan Carlos Osorio, facing a Croatia side primarily derived from Prva Liga sides Hajduk Split and Rijeka and with few of the “big names”, found their chances against the Vatreni. First in the 14th minute, Oribe Peralta latched onto a long pass and collapsed in on the penalty area near the endline, with what appeared to be time to shoot. But the Porto-based midfielder was too tentative in his approach with the shot and lost the ball to the onrushing Croatia defenders who had closed on him. On another episode, in the seventeenth minute, Hirving Lozano is able to break the Croatia lines and lose his defender’s mark, but he decides to head the cross to no one in particular, and it ends up going wide of the target. 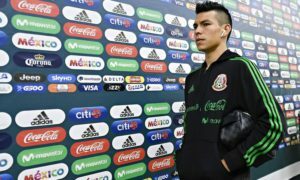 With a lack of ideas of how to break the defensive structures of their opponents, Mexico’s midfield and defenders started to fail to recognize when Croatia had breached their lines. And in the 35th minute, after a long pass that Ivan Santini controlled quite easily and backheeled a low-pass inside the penalty area to an onrushing Duje Cop, who opened the scoring for the Vetrani. Then immediately after Cop’s goal, the Sporting Gijon striker’s interception of Diego Reyes on a moment of indecision for the Real Sociedad-based center back led to Croatia doubling their advantage. After taking the ball off Reyes, Cop dribbled inside the penalty area with Hugo Moreno far away from the play and found Fran Tudor completely unmarked. Tudor then completed a simple finish on the ball past Guillermo Ochoa to take the Vetrani‘s lead to 2-0. After wholesale changes which included the introduction of Andres Guardado, Jonathan Dos Santos, Carlos Vela, and (eventually) Javier ‘Chicharito’ Hernandez, El Tri found themselves more confident and more able to turn their possession into better half-chances. And that the same time, they seemed to make their decisions more quickly than they had in the first half. Croatia goalkeeper Lovre Kalinic had to stop direct attempts on goal from both Andres Guardado and Carlos Vela (outside the area) during the opening phases of the second half. But after a period in which saw few chances on goal for anyone, ‘Chicharito’ Hernandez finished off a corner kick in the 87th minute to cut his team’s deficit in half. The goal, a header from inside the six yard box, was the goal that helped the former Chivas and Manchester United striker become Mexico’s all-time leading scorer with 47 senior international goals, breaking the tie with now-ESPN commentator and former Santos Laguna and Atlas striker Jared Borgetti, who was at the stadium on duty for his current players, for that position. But the record breaking goal was not enough for El Tri to avoid its first competitive defeat of 2017, and its first defeat since losing 7-0 to Chile in the quarterfinal of the Copa America Centenario. 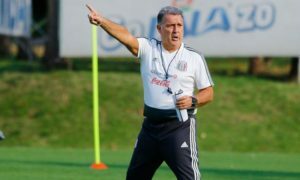 And in the loss, without both the Tigres and Chivas contingent, as well as Marco Fabian and a number of veterans, Juan Carlos Osorio saw a team that was a mirror image of the one at the current FIFA U-20 World Cup which could string together passes in the midfield, but were not malicious, instinctive, and organized enough in their approach to really trouble even “C” teams from many of the ‘elite’ national sides whose company that many El Tri fans think their team is equals with. 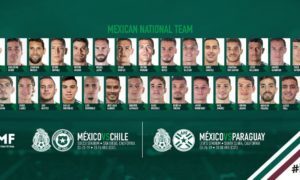 With potentially Marco Fabian, Carlos Salcedo, Orbelin Pineda, Jesus Duenas, Javier Aquino, and Jurgen Damm all joining the team, Juan Carlos Osorio has one more friendly against the Republic of Ireland in East Rutherford, New Jersey on Thursday, June 1 to sort out what collective issues were exposed by Croatia today and reduce his squad by nine players before the World Cup qualifiers on June 8 and June 11. 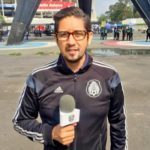 However, given that Mexico will need to get results against two European opponents, including the hosts, who may play against Mexico in similar ways and be even more malicious and technical in doing so, these problems could definitely mean a “three games and out” from the FIFA Confederations Cup is now a strong possibility.